We believe that the best way to learn music is with one-on-one private instruction. Each lesson is tailored individually, for the way the student learns best. We take into account age, experience, personality, and learning style. We teach ages 5 - adult! It's never "too late" to learn how to play music. Students in private lessons are able to learn the type of music they personally are most interested in. Our teachers can focus 100% of their attention on that one student to ensure that hand positioning, posture or the understanding of a particular concept are correct. If a student has a particular difficulty in one area, the teacher can work on it without hampering the progress of a class of students and, alternately, if a student is excelling in one area, the teacher can move on. We offer 30 minute, 45 minute, and 1 hour lessons. Our school is equipped to offer music lessons for students of all ages and abilities, from beginners to very advanced students. Our teachers can teach many styles of music - let them know your interests! 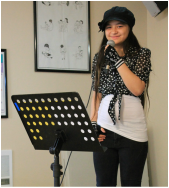 Music Lessons for all ages and abilities - Start anytime! Kiddy Keys 3.5 - 6 yrs. ﻿What do you learn in your Music Lessons? All of our teachers are college educated and have many years experience teaching music to individuals and groups. They also have a strong desire to teach and pass on the love of music to others. Many of our instructors also perform on a regular basis, in churches or with their bands, both locally and throughout the country. In addition to their teaching credentials, our teachers have warm personalities, are extremely friendly and strive to get to know each student and their parents on a personal level. Our guitar and bass teachers teach rock, blues, metal, country and classical styles. Students may learn on either acoustic or electric. Beginner students can expect to work on chords, simple songs and melodies, sight reading and theory. We balance musicianship and fun by making sure that each lesson you are challenged with a new technical concept or theory, but always end with something fun, such as your favorite riff or song. We use a combination of guitar method books and sheet music to accomplish this, and we encourage students to bring CDs or iPods to their lesson to learn their favorite tunes. 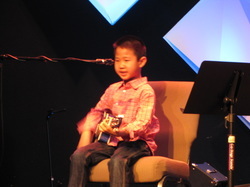 If you do not have your own guitar, we have rentals available for only $16.95 per month. Ukulele lessons are very similar to guitar lessons, however, we are able to start children as young as age 5 because a ukulele is a smaller instrument and therefore easier for a younger child to manage. 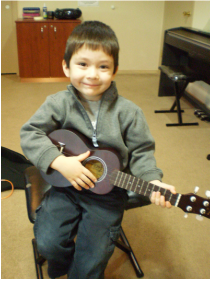 If you don't have a ukulele at home, we have rentals available for only $9.95 per month. Our piano teachers teach a variety of styles from classical to popular music. Whether you want to learn Bach or Alicia Keys, our teachers are happy to help you become the pianist you want to be. Our piano teachers will show you the fundamentals of sight reading, technique and theory, but they will also incorporate your favorite songs into your lessons. You do not have to have a piano at home to take lessons. A simple electronic keyboard will suffice in the beginning. Our piano teachers have warm personalities and enjoy sharing their love for the piano with you. If you don't have a piano or keyboard at home, we have keyboard rentals available for only $16.95 per month. For children age 3 1/2-5 we suggest starting in our Kiddy Keys program. See information under the Music Class tab. We have one the option of learning drums on an acoustic or electronic drum set. Our drum instructors teach rock, metal, jazz, funk, blues and many other styles. Drum language can be complex and our instructors will challenge any drummer with a wide variety of technical exercises designed to improve your speed and comfort. All drummers bring in their favorite drum parts to learn in their lessons and theory is encouraged. You do not have to purchase a drum kit to take lessons. Beginning students can learn with a drum pad and sticks both of which we have available to purchase. 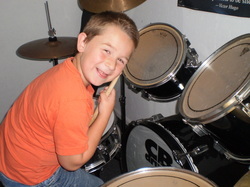 Students use our drum set at their lessons and do not have to bring anything except their drum sticks. Vancouver Music Academy offers violin, viola, and cello lessons for individual study for the beginning, intermediate and advanced string player. As you progress through technical exercises and repertoire, you will learn to play with accurate pitch, tonal sensitivity, improved finger dexterity, and musical artistry. Topics covered will include tuning and ear sensitivity, hand positions, bowing and finger technique, posture, and building a repertoire of classical and contemporary music. Method books used include Muller Rüsch String Method, Suzuki Violin School, and Craig Duncan Solo Pieces. Lessons may be customized to fit you or your child’s personal tastes in music, needs and musical goals. We do have violin rentals, for $16.95 per month, for cello and viola rentals we can give you recommendations in the area. Banjo and Mandolin have become very popular in today's folk and rock music genres. 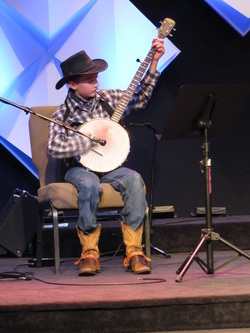 Banjo is also very popular in country and folk music. Topics covered in our lessons are tuning, playing position, musical symbols, notes in first position, chords, tabs, rhythms, strumming and picking. 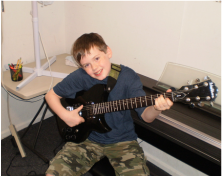 Our teachers teach rock, blues, metal, country, classical, and may incorporate additional curriculum and repertoire to fit you or your child’s personal musical tastes, needs and goals. Your teacher will customize a course of study for you and provide you with supplemental learning materials. The classes are open to Vancouver Music Academy students ages 10-17 who have taken lessons for a year or have the recommendation of their teacher. We have several ensemble groups to chose from : Classical/ Rock and Pop. This program is a chance for your child to meet others, learn how to play in a group, and perform together in the community Groups meet twice a month Cost: $42/month - Regular lessons are required. Ask your teacher or the front desk for more information. first served basis, so contact us today to arrange your first lesson.